Alex Salmond has warned Tory ministers that a failure to respect a Holyrood vote against Brexit would lead to a second independence referendum. The former First Minister of Scotland warned Westminster “can either respect the wishes of the Scottish people or face indyref2”. The dramatic intervention followed a landmark hearing at the Supreme Court on whether MPs can vote on leaving the EU before Article 50 is invoked. Scotland’s top law officer James Wolffe warned that not consulting the Scottish Parliament on Brexit would “bypass an important constitutional requirement” at the end of the four-day hearing in London on Thursday. Now Alex Salmond has said Holyrood voting against Brexit would “pile the pressure” on the Prime Minister to accept Sturgeon’s demand for Scotland to retain its place in the single market. 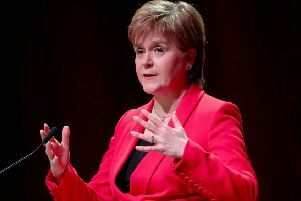 First Minister Nicola Sturgeon will unveil specific Scottish Government proposals in the next fortnight to keep Scotland in the single market. Salmond said that the First Minister’s paper will give “guidance and strategy” in the SNP’s battle with the Tory government during the Brexit process. But he added that Holyrood voting against Brexit would give Sturgeon a “very powerful hand” in seeking to protect Scotland’s place in the single market. The SNP’s international affairs spokesperson at Westminster said: “It would pile pressure on the UK Government to make some specific concession with regard to the single market. A judgment from the Supreme Court is expected to be delivered in January. The UK Government has said it does not believe it is necessary to ask either the UK or Scottish Parliaments, and want to trigger Article 50 by using existing ministerial powers. SNP ministers have made the case that Holyrood should be formally consulted on Brexit and have asked for the Parliament’s consent. Salmond said that if Westminster ignored Holyrood’s wishes and insisted on retaining ultimate authority it would set a path towards a second independence referendum. He said: “If the UK Government doesn’t accede to Scotland’s interests and it ignores the Scottish Parliament then that makes another independence referendum, as the First Minister has already said, highly likely. “If the UK Government fails to respect the wishes of the Scottish people, it creates the case for indyref2. “The UK Government has got a choice: they can either respect the wishes of Scottish people or face indyref2. “They have to decide - either accede to Scotland’s long-term and legitimate interests or face that referendum. A UK Government spokesperson accused Salmond and the SNP of issuing “damaging threats to rip Scotland out of the UK”. The spokesperson said: “We are determined to get the best deal for Scotland and the whole of the UK as we exit the EU.